We're at Flamecon this weekend! Tables 20-21! FLAMECON IS THIS WEEKEND! Find us at tables 20-21! We'll be tabled up with Tessa (Not Drunk Enough) and Ngozi (Check Please!). 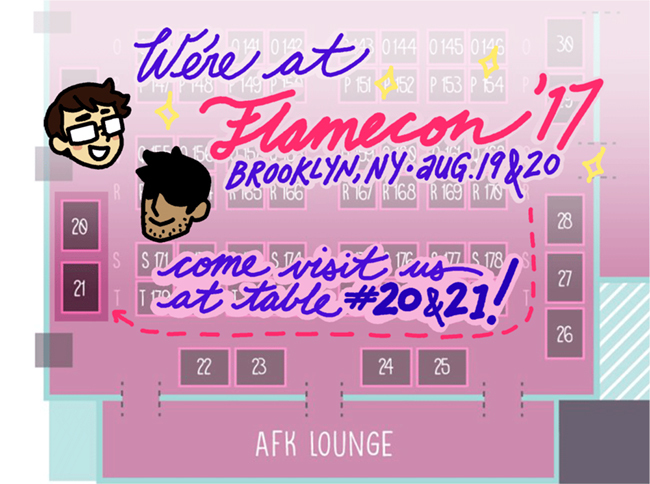 Flamecon is held in Brooklyn, NY on August 19-20 (that's this weekend!). We'll have a ton of stuff -- come say hey! Hey guys! Excited to tell you that if you missed the Omnibus kickstarter then you're in luck! You can now buy the Omnibus, LTD Omnibus and Maw Plush in the online store!